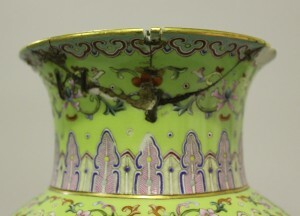 A chipped and heavily repaired vase went under the hammer for an extraordinary £520,000 at fine art auctioneers Toovey’s Spring Gardens salerooms at Washington on Thursday 4th December 2014. 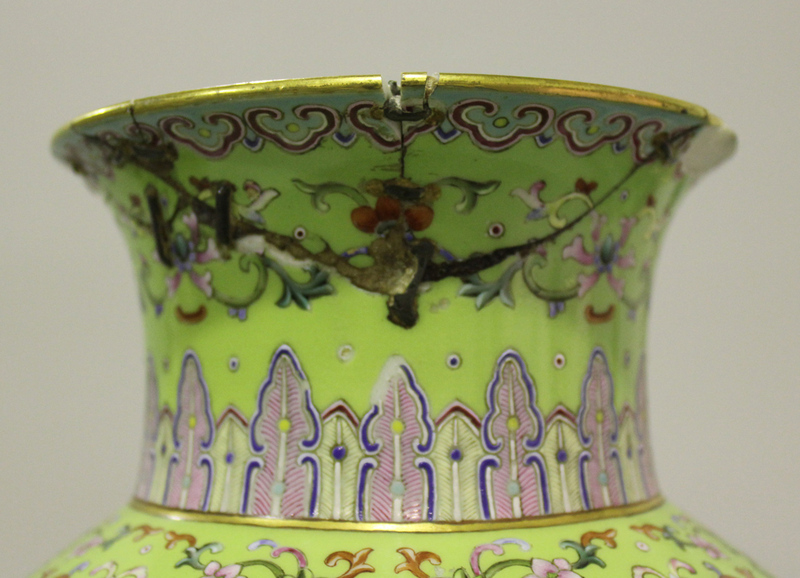 The 40.3cm-high Chinese famille rose and pea green ground vase dated from the reign of the Qianlong Emperor (1736-1795) and would originally have been a decorative piece made for one of the emperor’s palaces. It was decorated with four floral panels representing the seasons, alternating with four further panels with poems in different calligraphic scripts. At some point in the 19th century, the rim had been broken into a number of pieces and repaired with rivets and metal wire, a popular form of restoration right up until the 1960s, when epoxy and polyester resin glues were developed. The rim also had a fair-size piece missing and there were other smaller areas of loss. 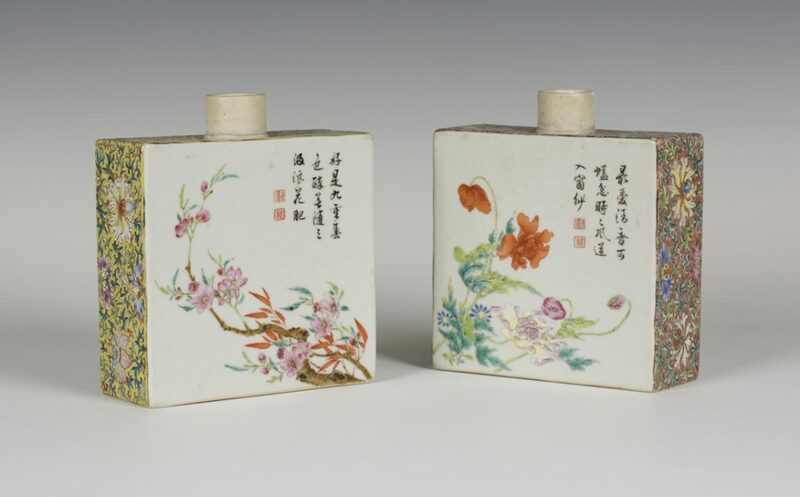 None of this put off a host of Oriental antiques specialists around the world and on the day nine telephone bidders, a strong presence bidding live online and a number of key UK and Chinese players in the room all vied for the piece. After a lengthy battle, the final bidding was left to two major collectors, one bidding from China by telephone, the other, the eventual winner, bidding in the room. The vase was discovered by Toovey’s following a routine enquiry by email from a local couple, attaching a number of images of items at their property which they wanted to auction. They were all modest items, except for the vase, which Toovey’s Oriental specialist Tom Rowsell immediately spotted as something potentially very interesting. 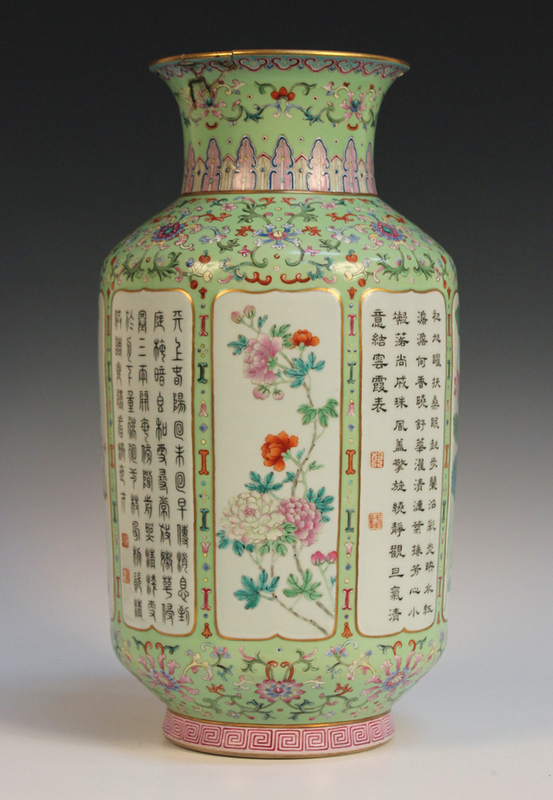 The couple subsequently brought the vase to Toovey’s to show Tom in person and he confirmed his thoughts that the vase was almost certainly Qianlong mark and period and a highly commercial piece in the current market. 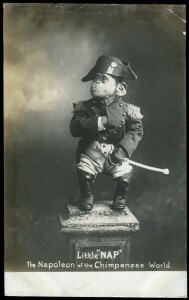 Toovey’s Oriental consultant, Lars Tharp, later concurred with Tom’s opinion. The vase had been inherited by the wife from her late father, who, she believed, bought it at auction in the 1960s. The couple had no idea that the vase was of any importance or value prior to contacting Toovey’s. This remarkable hammer price rounds off a record year for Toovey’s, who have been steadily notching up an impressive run of results throughout 2014. 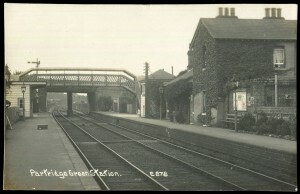 Private collectors went loco for a small group of individual postcards of Sussex railway platforms. No less than four successful collectors express-ed an interest, each chuffed with their purchases, once again proving the Sussex postcard market is far from station-ary! Bad puns aside, £120 was paid for an RP of ‘Henfield Station’ with a steam engine entering the now-vanished station. The exact same view with small loss to one corner only made £30, reinforcing the difference condition makes to the private collector. RP views of ‘Partridge Green Station’, ‘The Station, Southwater’ and a different view of ‘Henfield Railway Station’ each sold for £110. Topographical postcards were popular throughout the auction but Sussex views continued to steal the headlines. An RP titled ‘Sussex Pruning Camp’, offered with a similar RP, sold for £95. 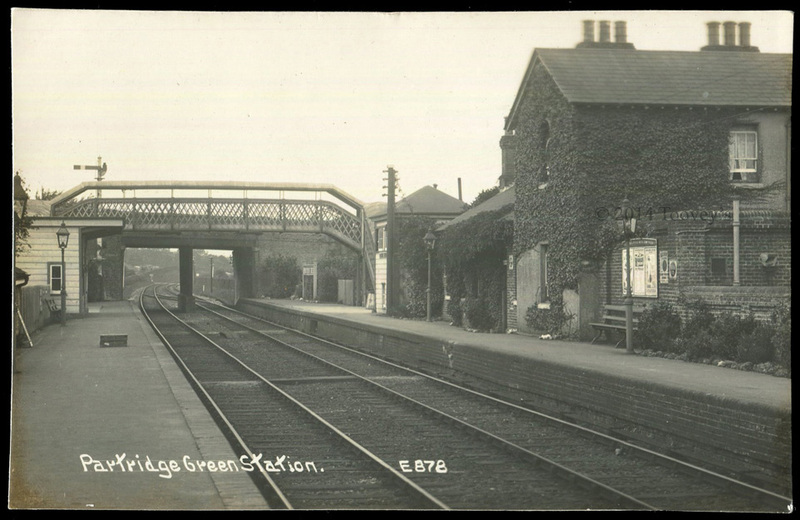 A group of 4 postcards of Partridge Green, including a scarce RP of ‘Jolesfield Windmill’, achieved £140. 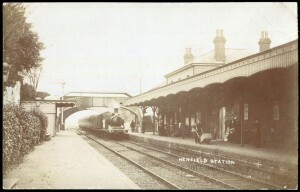 A similar group of 13 postcards of nearby Cowfold and Shermanbury realised £240 and 31 postcards of Henfield sold for £420. All of these lots went to private collectors. Outside of the Sussex scene, notable prices included 8 postcards of Barnes and Isleworth, which topped £120. An album of 52 postcards of the Channel Islands, predominantly Jersey, went at £320. A group of 160 of Middlesex reached £340 and £20 was paid for a slightly faded RP of ‘Finchley Rd Station’. A private collection of postcards published by LL performed well too, including a 286-postcard collection of London, which sold for £480. Topography was not the only area of interest. 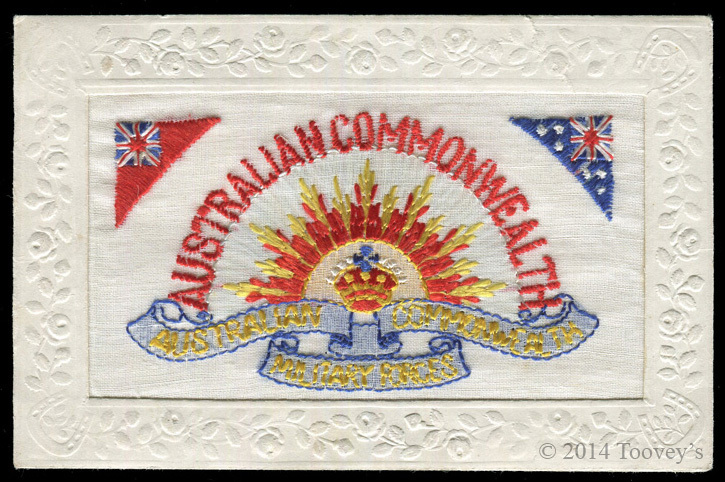 Leading the fray at £1500 was an album of 74 postcards, including a brilliant selection of regimental embroidered silks, which went to an internet bidder despite the busy room. 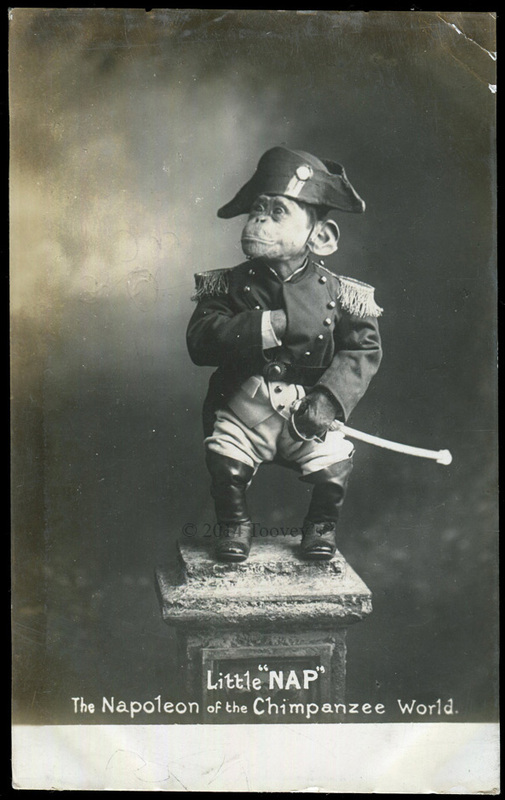 One of the surprising results of the sale came in the form of a single RP of ‘Little Nap’, a chimpanzee dressed-up as Napoleon, which, after a battle between a private collector and the internet, sold for £60 in the room. A good selection of Art Nouveau, Art Deco and glamour postcards also attracted serious interest and stiff competition among bidders. 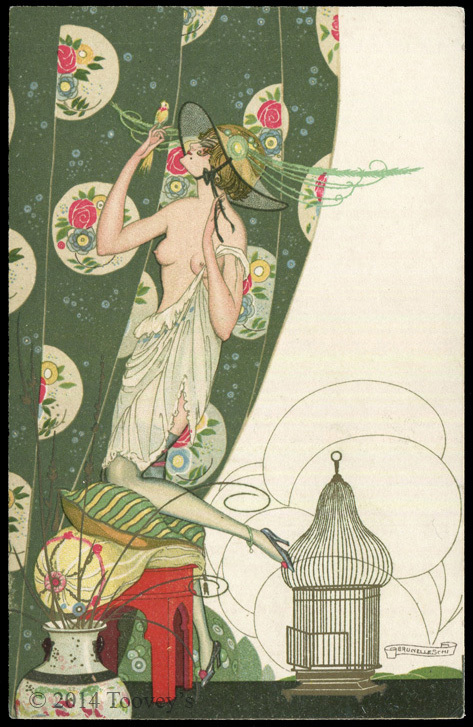 A group of 6 Art Nouveau colour postcards by Umberto Brunelleschi was hotly contested, largely due to their great condition, selling at £380, just over £60 per postcard and nearly double their mid pre-sale estimate. 4 Italian Art Deco postcards by M. Montedoro achieved £130 and 9 postcards by Raphael Kirchner realised £160. Arguably among the scarcest of postcards included in the auction was a large group of composite puzzle postcards, divided into 11 lots. 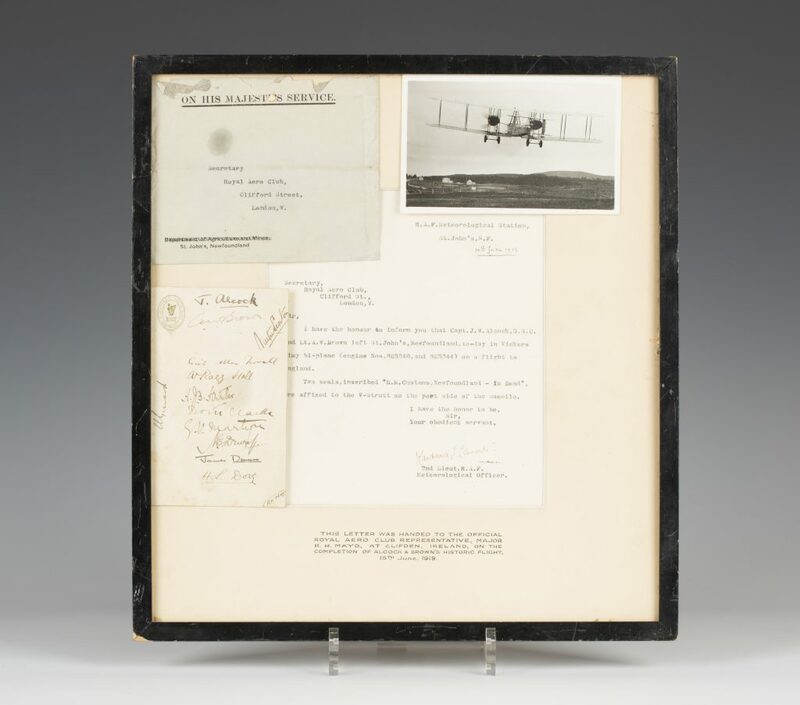 Highlights included a set of 4 colour printed postcards titled ‘Fridtjof Nansen Nord Polar-Expedition’, which sold to a collector at £130, and a set of 6 French hand-coloured postcards of Barnum Circus, which went for £140. To view all the previous sale results click here. 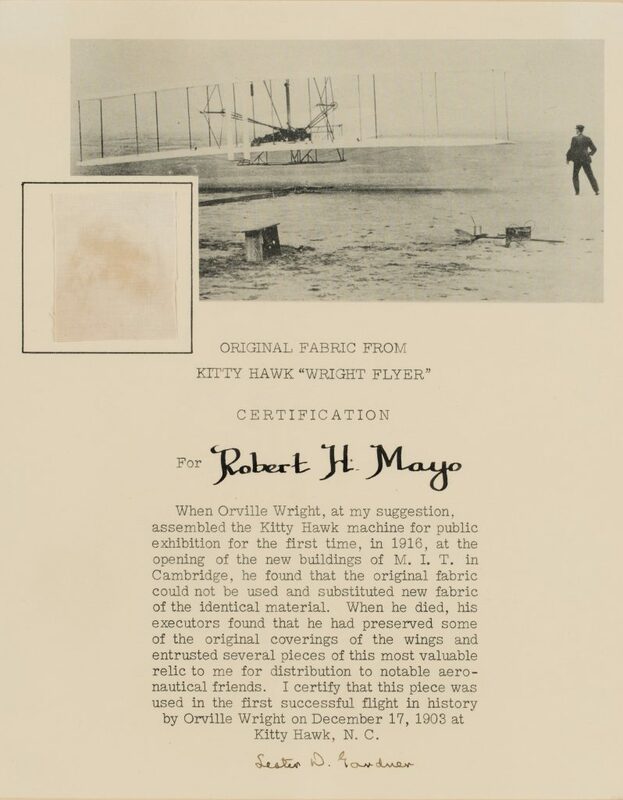 Toovey’s next auction of Paper Collectables, including postcards, stamps, cigarette cards, photographs, autographs and ephemera, will be held on 4th November 2014. 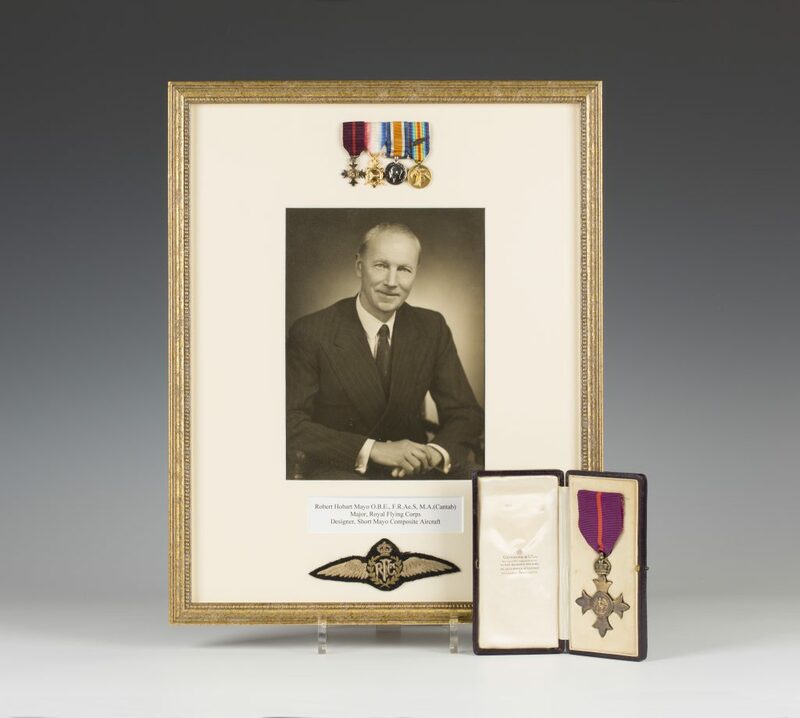 Whilst this auction has now deadlined, four have been scheduled for 2015 due to the popularity of the Paper Collectable auctions at Toovey’s. Contact us to discuss your postcard collection for one of our future specialist sales. By Nicholas Toovey, a member of the Postcard Traders Association. 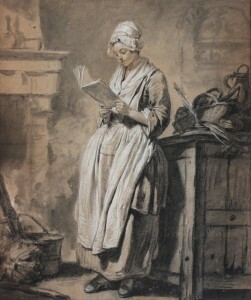 Originally published as a Sale Report in Picture Postcard Monthly October 2014 issue.